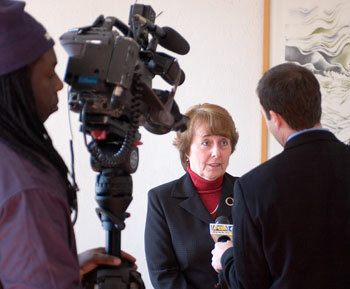 Barbara Jacobs, assistant professor of nursing, is interviewed by a television reporter during a statewide summit on the nursing shortage Feb. 28. Eight individuals who have achieved success in politics, writing, business, bioethics, medicine and the law will receive honorary degrees from UConn in May, and four will address students during Commencement ceremonies in Storrs, Hartford, and Farmington. The scope of today’s nursing shortage and the implications of that shortage for nursing education was the topic of a nursing summit organized by faculty from the School of Nursing on Feb. 28 at the law school. Michael Willig accepted the position as director of the new Center for Environmental Science and Engineering (CESE) at UConn because he believes that environmental problems will be the greatest challenges facing society in the 21st century, and that UConn has the resources to help combat them. From yoga to acupuncture, massage to meditation and Reiki, the Health Center is teaching students about some age-old healing strategies and offering them to patients. It is also applying rigorous scientific study to some of these approaches.